Mike Peters and his bandmates met with their new manager one day some 30-odd years ago, and told him they already were done being a supporting act. “From now on, we only headline shows. We don’t want to be a supporting act,” the members of The Alarm said to their sympathetic manager. The tour was successful, and U2 invited The Alarm to tour with them in America well, introducing their Welch friends to the United States. The bands remained friends through the years, and U2 recorded a cover of The Alarm’s “Blaze of Glory” for a BBC Radio Wales special on the 30th anniversary of The Declaration, the first-full length album from the band, which aired in April. That was one of many great little stories that Peters told in his visit to Gypsy Sally’s on Thursday, Aug. 7 in support of that same anniversary. Peters was an excellent and entertaining storyteller–so much so that he may have displaced Dave Wakeling of The English Beat on my list of favorite rock raconteurs. Peters, performing solo with a guitar, ran through the entire Declaration album, although not in order of the tracks. Indeed, he opened with other tracks–“Unsafe Building,” “Lie of the Land” and “Up for Murder”–before hitting The Stand. Needless to say the audience, a robust yet still intimate number, went wild for it. Other amusing anecdotes emerged throughout the performance. Peters recalled playing “Where Were You Hiding When the Storm Broke?” on the band’s first appearance on famed UK show Top of the Pops. 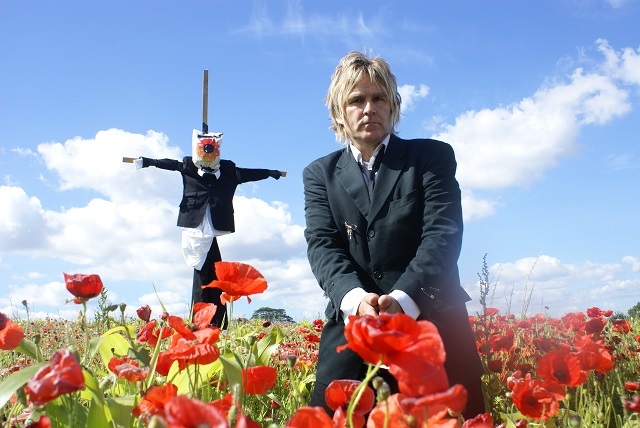 The Alarm appeared on the program with the mind-bending lineup of The Smiths, Echo and the Bunnymen and Madonna! Knowing that The Alarm were up against bands that were hard to out-perform, out-intellectualize or out-sexualize (depending on your speed), Peters came up with the concept of throwing out a deck of playing cards at the end of the song to add a layer of stage theatrics to it. The performance kicker stuck, and Peters (or in Thursday’s case, a member of the audience) has done it ever since. Later, Peters played “The Deceiver,” a song whose title is emblazoned on his guitar, and recalled in detail playing it at The Bayou, which once stood only blocks away from Gypsy Sally’s location, during The Alarm’s first-ever performance in DC. All in all, Peters put on an incredibly satisfying and entertaining show in a venue well suited for his solo performance and witty recollections. Sadly, he closed up his U.S. tour with a date in New York over the weekend, so you’ve missed your chance to see him this time around if you didn’t make it out. Hopefully, we’ll see him again soon. Update: I’ve learned Mike Peters has two upcoming U.S. shows! Photos of that great show are on my Facebook page,enjoy! Mike isn’t done yet. September 19th in New Hampshire and September 20th in Boston . mickey, he has 2 more east coast shows in september, he’ll be at the tupelo music hall in londonderry nh on september 19th and at johnny d’s in somerville boston on september 20th. i would urge anyone who can to go, i did the 6 n.y.c. shows and they got better as he went along! howard, great minds think alike! Thanks gents… I’ve updated my info so anyone who might land on this page via Google will see the next dates easily!